Rockstar Energy Racing's Jason Anderson is making the leap to the premiere class in 2015 and is doing so aboard the new Husqvarna FC450. After winning a West Coast 250 championship in 2014, he is certainly excited to move on to the next challenge of his career. Being one of the bigger riders on the line in the 250 class, he was also eager to jump on the larger bike. Usually there is some time needed to get used to the increase in power, but Jason adapted right away. Anderson was slated for his inaugural race on the 450 this past weekend in Stockholm, Sweden. This event was particularly special with the birthplace of the Husqvarna brand being just 3 hours down the road in a town aptly named Huskvarna. With various Husky representatives as well as some former champions of the brand present, the stage was set for a historic debut. Jason did not disappoint. It was clear as early as press day that the track was going to be very soft. After several laps with limited riders, the track was extremely rutted including the jump faces of the larger triples. It was so bad in fact that the promoters wisely decided to add a concrete mixture to the lips to help hold them together. It certainly helped, but with the amount of riders on race day and number laps being spun, they really had to stay on top of maintenance throughout the show. 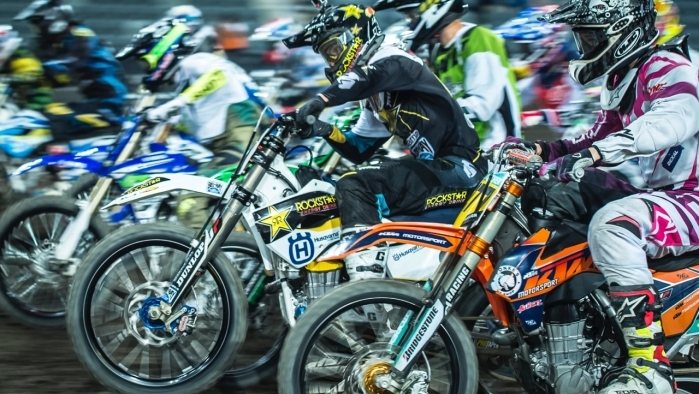 There was a bit of a different format in place than US Supercross regarding qualifying. When you qualified in your heat, you still had to go to a semi to qualify for the main, then there was a 2nd chance qualifier to go to semis and finally a last chance to get into the main. Anderson got into the lead in his heat until swapped out onto the very slick plastic and went down. He was able to recover while wrapping a banner up in his rear wheel in the process. After all of that, he still finished 2nd. In his semi he was able to get the holeshot and was not challenged all the way to the checkered flag. Anderson was ready for the main event. He pulled the holeshot again and immediately began to pull away. This race also featured a joker lane, where each rider must go through a slower section on any one lap of their choice. If they forget, they are docked several positions. Jason's mechanic Chris Loredo made a wise decision to have him take the alternate lane early on lap 3. Usually riders wait a little longer to avoid losing positions. Loredo's strategy was that if Jason took it early, he could still pull back away as he was doing triple combinations in rhythm sections that other riders were unable to do. The catch is that as the race wore on, the ruts got too severe to successfully negotiate his faster lines through those sections. The plan paid off and Anderson rode away to a massive lead and eventual easy victory. Jason Anderson: "It was a really cool opportunity to come out here to Sweden for my first 450 race. We even got to go check out the Husky museum and some cool parts of the city and countryside. To come away with the win just made the trip that much more rewarding!" Jason now heads back to California to prepare for the upcoming MEC Supercross at Sam Boyd Stadium in Las Vegas. He will be joined by his other teammates for the one off race and then will turn his focus to Anaheim 1.